The radiant cut diamond combines the silhouette of an emerald cut diamond with the fire and sparkle of a round brilliant cut diamond. 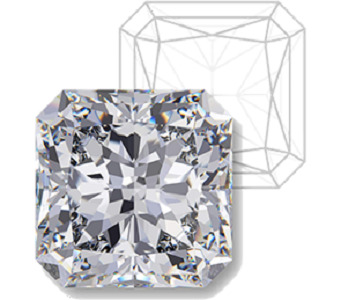 Due to its design, this shape requires more carat weight in the depth to maximize brilliance. A square or rectangular shaped hybrid cut that combines the brilliance and depth of the round, emerald and princess cuts, the radiant is the most brilliant of all the squared shapes making it both a beautiful and dramatic choice. The Radiant is a unique and hybrid cut comprised of 70 facets and distinctive trimmed edges. Square-shaped Radiants typically have ratios between 1.00 and 1.05 while rectangular Radiants can have ratios from over 1.05 anywhere up to 1.50. Its versatile design combines the brilliance and depth of the round, emerald and princess cuts making it a popular choice for all types of jewellery. As it is a patented cut, it may be referred to as a Cut-Cornered Square on a laboratory certificate (eg. GIA or AGS), or a Rectangular Brilliant if it has a ratio greater than 1.05. Because of its extra facets, the Radiant cut can disperse more light through the stone making it one of the most brilliant of all square and rectangular shaped stones. It also hides inclusions more efficiently than other shapes. As it is a hybrid cut combining the features of both brilliant and step cuts, the Radiant is the ideal compromise and the perfect solution for someone who wants to have it all. There are diverse preferences when it comes to shape in radiant cut diamonds, from a perfectly square 1.00 length to width ratio (any ratio of 1.05 or less will appear square to the naked eye), to a more traditional rectangle. The rectangular radiant cut is an excellent option for buyers who like the emerald cut shape, but want something with the brilliance of a round. 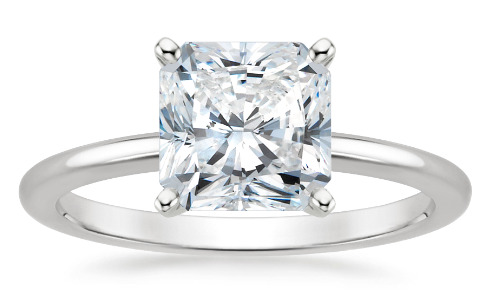 The square radiant looks very similar to a princess cut, but with cropped corners. Once set, a square radiant and a princess look virtually identical, since the prongs cover the corners. The radiant cut diamond is the first square cut (the second being the princess) to have a complete brilliant cut facet pattern applied to both the crown and pavilion, creating a vibrant and lively square diamond. First popular in the 1980's, the cropped corner square shape of the radiant is a nice bridge between a cushion and a princess cut, and for that reason looks beautiful set with both rounded or square cornered diamonds. In longer (more rectangular) radiant cut diamonds, a bow-tie effect is more likely (although not as common as in oval, marquise, and pear cuts), varying from near invisible to severe. The visibility of a bow-tie effect cannot be ascertained by reviewing the diamond certificate or dimensions, but only upon visual inspection. There are diverse preferences when it comes to shape in radiant cut diamonds, from a perfectly square 1.00 length to width ratio (any ratio of 1.05 or less will appear square to the naked eye), to a more traditional rectangle. The rectangular radiant cut is an excellent option for buyers who like the emerald cut shape, but want something with the brilliance of a round. The square radiant looks very similar to a princess cut, but with cropped corners. Once set, a square radiant and a princess look virtually identical, since the prongs cover the corners. The first Radiant cut was designed by Henry Grossbard of the Radiant Cut Diamond Company (RCDC) in 1977. Prior to this invention, all diamonds with square or step cut edges appeared less brilliant. Grossbard invented a hybrid cutting style that revolutionised the industry's perceptions towards square or rectangular stones as he managed to create a step cut diamond that possessed equal brilliance to triangular faceted diamonds such as the oval and pear. The Radiant is also the first cut to have a brilliant-facet pattern applied to both the crown & pavilion. RCDC launched the Original Radiant Cut diamond brand in 2002.